As the healthcare industry continues to innovate with improved technological solutions, one specific market has rapidly gained traction on a global scale. With a 2017 market value of $32,842.48 (USD) million dollars and a forecasted expansion of a whopping 18.83% between 2018-2023 according to Mordor Intelligence,the telemedicine sector is making huge strides in availability. This has led many major hospitals, clinics, and medical practices to adopt the technology at an alarming rate, ultimately allowing healthcare professionals to now treat, diagnose, and evaluate patients through the use of telecommunications technology. Seeing patients in person for every healthcare issue they encounter is becoming a thing of the past, and so for companies who have yet to adopt this new technology, there are several reasons why you should consider hiring a healthcare software development company to build you a unique telemedicine solution for your business. 1. Your Practice Will Have Increased Flexibility. Iot Enabled healthcare Solutions offers new ways to connect patients to vital health care services, through options such as remote monitoring, electronic consults, wireless communications, and video conferencing. The flexibility that this brings allows patients to be mobile and allows doctors to work from various locations as they know that they can use mobile applications to connect with one another through live video or instant messaging. Beyond this, a health care workplace that uses telemedicine can offer their medical staff some flexibility to adhere to a healthier work, life balance, as appointments can be scheduled based on the hours that best suit both the employees and the patients. 2. Your Staff Will Have Less Exposure to Illness. Whether your company is a long-term care facility like a nursing home, a walk-in clinic, or an emergency room operation, the healthcare staff you have are at risk for contracting the illnesses that patients bring in. With Vital monitoring system, the exposure to germs and contagious diseases is reduced exponentially as they can diagnose, evaluate, and create treatment plans from afar. Not only does this reduce in-person contact but it keeps everyone else who does come into your practice, safer from illness. 3. Your Practice Will Have Greater Access to Specialists. There are approximately sixty million individuals or 19% of the United States population & even more in Canada, that lives in rural areas who may not have quick access to health care services or facilities. Situation is even worse in highly populous countries like India , China.Telemedicine can help bridge this location gap by providing access to specialists who can treat, diagnose, and evaluate from afar. Not only can rural customers discuss medical history with specialists via video conferencing, but they can also inquire about their ailments and hear, first hand, what the general consensus is of what is going on with them, what actions they should take, and where they should go from here on out. This reduces the waiting time that is needed to pass information from the doctor to the patient. 4. There is a Potential for Increased Revenue. 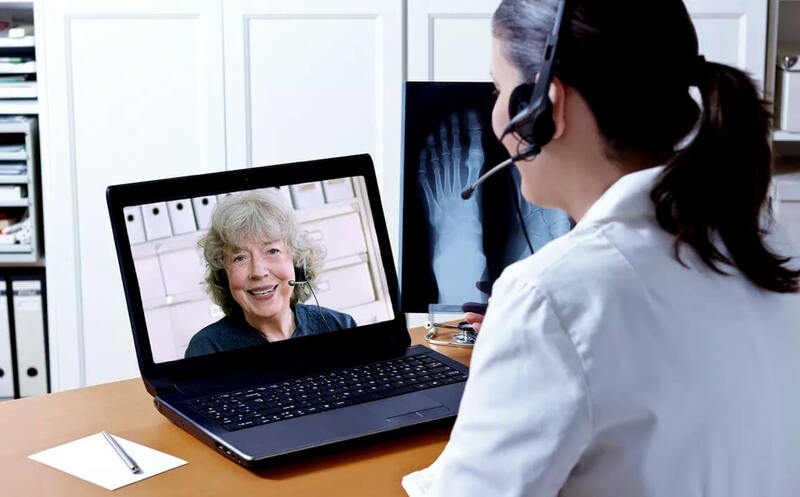 Since telemedicine opens up more access for patients in rural areas and expands the accommodation hours, clinics, hospitals, and other health care facilities can see more patients as the technology use with telemedicine makes e-visits productive and efficient. In being able to see more patients without having to increase office hours or employee salary, revenue potential increases. 5. You Can Reduce Your “No-Show” Rates. Telemedicine helps curb one of the biggest factors that impacts lost revenue – missed appointments. When patients are unable to show up for an appointment, whether it be because of a traffic jam, work obligations, or a lack of childcare, this costs the health care facility quite a bit of money as time set aside for the patient gets wasted. Patients are less likely to miss appointments since it eliminates transportation problems and allows appointments to be taken at inopportune places, such as at home while the children are present. 6. You Can Gain a Competitive Advantage. The competitive advantage you get from telemedicine may be the reason patients choose your health care facility over another. Not only does telemedicine allow you to offer valuable services in a convenient and more accessible way, but it also saves patients time and money which makes you more attractive. 7. Open Up Greater Forms of Payment to Patients. We have all been there, where we go to pay for something and don’t have the cash on us or our cards don’t want to read in the machine. Collecting payments from patients can be difficult at times, but with telemedicine, you can offer different forms of payment such as prepaid options or even billing accounts. This helps ensure that your practice will always receive the payments for the services you provide without having to worry about chasing patients around for the money owed. Beyond this, it allows for payments to come in faster because of the convenience telemedicine technologies provide – send off a bill and receive payment within minutes. 8. Retain a Happier Workplace. Depending on how many of your employees take on the use of this technology, you may be left with a less crowded health care facility. This can benefit the facility as it will help reduce the workload on internal staff and the stress that comes working in an environment that is constantly crowded. Beyond making your employees more focused and productive, your patients will thank you too. 9. Enjoy Better Cost Efficiency. Although you may not be able to charge as much per patient visit with telemedicine technology, you do have better cost efficiency as you can scale the number of patients you take in while saving time, and without increasing payroll expenses. 10. Attract New Patients and Retain Your Existing Ones. With telemedicine allowing you to scale up and see more patients, you can increase and improve the engagement you have between patient and health care facility through convenient services. New patients will be attracted to using this service, plus it costs them less and it saves your company money, which is a win-win situation. Beyond this, if you have patients that move away or take on new life responsibilities that have them coming in less, you won’t lose them as a patient. So, whether you are a walk-in clinic, a privately owned health care facility, or a major hospital, taking on and adopting telemedicine mobile apps in your practice will not only help you become more cost efficient but it will provide you with a competitive edge and a new service to offer new and existing patients alike. If you would like to learn more about obtaining a unique telemedicine solution for your practice, the dedicated team at Let’s Nurture would be happy to assist you.